I enjoyed this a bit more than The Forest of Hands and Teeth. There was a wider view of the world where the community was not as sheltered and led to believe they were the last ones left alive. It gave the story more to work with. As for Gabry, the inner monologues of her doubts became redunant and I couldn’t get into the love triangle between her Catcher and Elias. Though I did like the boys individually. I did really like the scenes between Gabry and her mother, Mary. That being Mary from The Forest of Hands and Teeth. The relationships and aftermath from the first book tie in nicely. Any questions I was left when I finished The Forest of Hands and Teethwere answered. 3.5 out of 5 Waves. 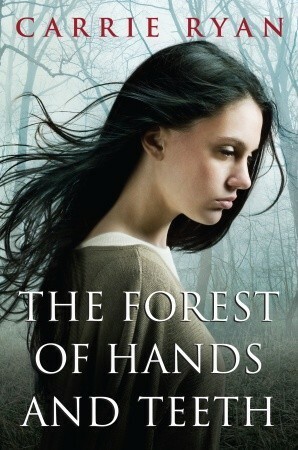 There are many things that Annah would like to forget: the look on her sister’s face before Annah left her behind in the Forest of Hands and Teeth, her first glimpse of the Horde as they swarmed the Dark City, the sear of the barbed wire that would scar her for life. But most of all, Annah would like to forget the morning Elias left her for the Recruiters. Annah’s world stopped that day, and she’s been waiting for Elias to come home ever since. 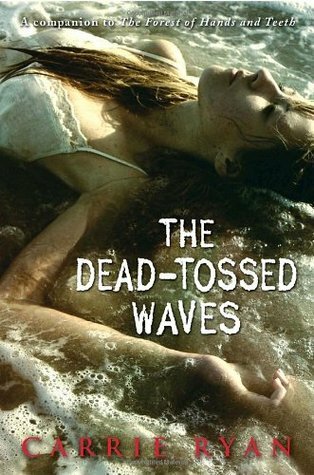 Somehow, without him, her life doesn’t feel much different than the dead that roam the wasted city around her. Until she meets Catcher, and everything feels alive again. But Catcher has his own secrets. 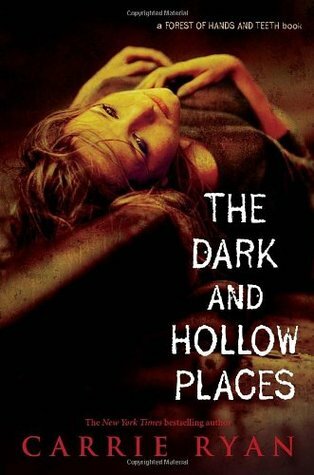 Dark, terrifying truths that link him to a past Annah has longed to forget, and to a future too deadly to consider. And now it’s up to Annah: can she continue to live in a world covered in the blood of the living? Or is death the only escape from the Return’s destruction? The set up was an improvement from last year. There was room to walk around and they gave out bracelets for the panels being held in the Special Events Hall. That prevented people from queuing up at 10AM for a panel that didn’t start till 3PM. Started off Saturday morning getting bracelets for Mindy Kaling in conversation with BJ Novak at 11AM and Room Film panel featuring first look and cast discussion. Mindy and BJ were very funny. I liked them both on The Office, and I can’t deny, I ship them in real life. I forgot how Mindy knew this story but it was a funny one about how when Tom Hanks and Dave Chappelle were filming You’ve Got Mail. It was at the time of the Seinfeld series finale and after a long day of filming they couldn’t find a place to watch it. So being on the Upper West Side (where much of Seinfeld took place) they figured everyone would be home watching it. They knocked on some strangers door and asked if they could watch the finale with them. Ok, when I tell the story it is lame, but look for this panel on YouTube and Mindy tells it right. I read the book sampler of Why Not Me? and I liked the part in the first essay about when you are still best friends with your best friend and you have that inside joke that lasts for years. And even just one phrase of that inside joke will still make you laugh. I read Room back in 2012 and had no idea it had been adapted into a film. It was because of Book Con that I found out. So I loved the book and was very excited about this panel. Emma Donoghue spoke about her process of writing the novel and then adapting it into the screenplay. I am so happy to hear she wrote the screenplay. I have much more faith in a book to film adaptation when the author is the screenwriter. She also said that a small Irish film company produced the film. Good, those big Hollywood suits often screw things up anyway. Brie Larson, playing Ma, and Jacob Tremblay, playing Jack, also spoke about their roles. Brie actually secluded herself for a month to prepare for the role. She also went on a special diet and built muscle tone to be able to keep up with a energetic 5 year old. Jacob was adorable and seemed a bit nervous but spoke really well in front of a large audience. Then it was up to the Exhibit Hall. We were not crammed into a tiny corner like last year. There was room to walk around and not feel like a salmon swimming up-stream. I didn’t see many book give-aways on Saturday. I picked up a few chapter samplers. 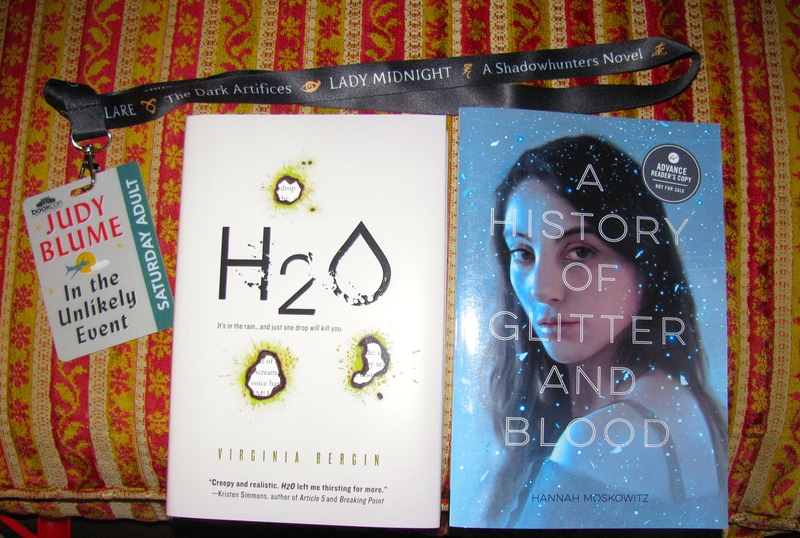 I only picked up one free book, H2O, by Virgina Bergin. It came with a poncho! Also, one of my friends gave me a ARC she picked up, A History of Glitter and Blood, by Hannah Moskowitz. What I liked best about this story is though there is a love square, the protagonist, Mary, doesn’t choice either suitor. She chooses her own path. I have seen some reviews call her selfish, and I disagree. Why should she compromise her faith and dreams to settle for anyone who thinks she is chasing a fairy tale? How unfulfilling. I did have a few issues with the story. I would have liked to know more about The Sisterhood; their secrets and their history. I suspect they were religious and political zealots who used the zombie apocalypse to their advantage to cut off the rest of the world and control the town in a puritan enviroment. (When reading about their world I was reminded so much of M. Night Shyamalan’s The Village.) It’s the only conclusion I came to because why not be proactive. Go out and kill the Unconsecrated. Take back the land, especially since most of them are so slow it would be an easy kill. They did a lot more scratching and clawing than biting. Also, I thought that since the village was run by religious fanatics that the story would go more into depth about Mary’s loss of her belief in God. I though that by the end when she finds what she was searching for her faith would be restored. The matter was dropped somewhere along the way. However, I still really enjoyed it. It was a page turner. I really wanted to know what would happen next. Mary didn’t hide in a corner and let the men fight. She found a way to overcome her nerves and fear to fight and survive. After finishing TFoHaT, I went back to re-read Carrie Ryan’s short story “Bougainvillea” in Zombies Vs. Unicorns. I remember it being one of my favorite stories in the collection, but had to refresh my memory as to why. It is set in the same universe, though I believe decades (centuries?) earlier and not in the forest. There are two more novels set in the same universe and I will read those next. I have been talking about all the lines I waited on and I wanted to add the one place I never waited on a line is the one you’d least expect – the women’s restroom. Yes, all weekend long I just walked right in and found an empty stall. It was like the Twilight Zone. Today was a sleep-in day for me. My photo op with the Geonosis Jedi was not until 1:30pm so I I didn’t get there till after 10am. My first stop was the Del Rey booth. They had already run out of the Heir to the Jedi pins and were looking for more. In the meantime I showed one of the Del Rey people proof of my Dark Disciple pre-order and received that pin. I also asked about Pierce Brown. Like I thought, he was only there on Friday. I later saw on Facebook that Pierce responded to my question. He said he’s back to the grind to finish Morning Star. At this point I saw they found another box of Heir to the Jedi pins but were not handing them out yet. The man who had given me the other pin and answered my question about Pierce handed me one on the down-low. That was really sweet. I think he liked that I was a fan of the Red Rising books and felt bad I missed seeing Pierce. 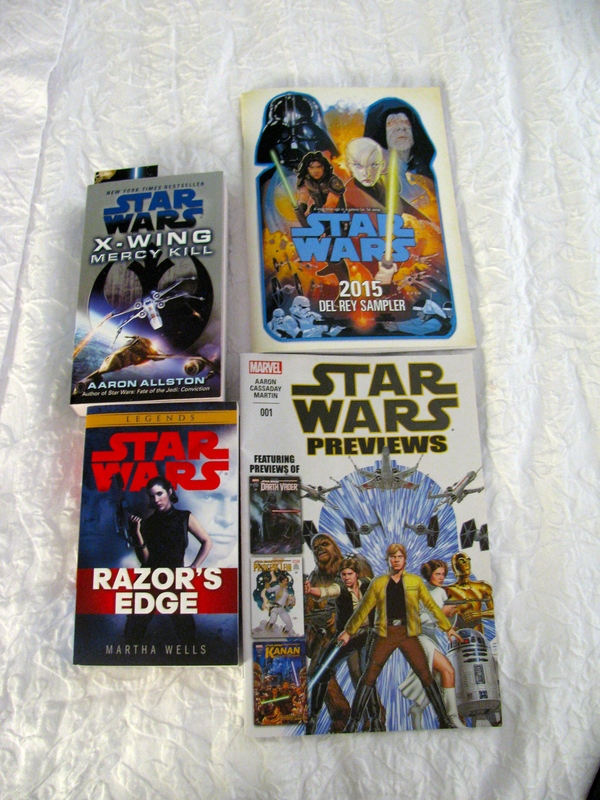 I then picked up a free copy of the X-Wing paperback, Mercy Kill and a sampler of their upcoming Star Wars books and the Marvel comic book. On Sunday I played the spin and win game. I landed on the prize of my choice. I wanted either the novel Kenobi or Razor’s Edge. I went with Razors Edge. This was the day of insane queues that needed better planning. I didn’t want to wake up super early and get caught in the holding room to enter the convention. I got there at 10am or just after the doors opened and got caught in the holding room anyway. Once I got into the Exhibit Hall I went straight to the Celebration Store. The system was an improvement from the day before. The rows snaked around to minimize space and people were let in groups. I heard from several people on the queue and from lazypadawan that the day before they had to close the store down because A) they were understocked and understaffed B) frustrated people just started walking off with merchandise without paying and C) the cashier machines were down and could not process payments. Example #1 of how TPTB underestimated the crowds at Celebration. So, first I waited 45 minutes to get into the store (10:30-11:15). I shopped around for about 15 minutes. 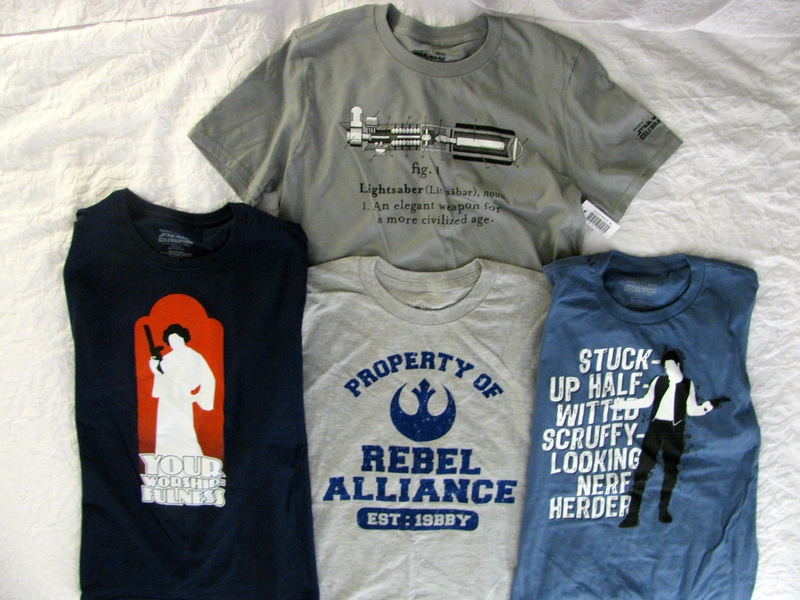 The Property of the Rebel Alliance shirt is a large. There were none left on the racks. I even asked a staff member to check in the back. She brought out a large, an extra-large, and an extra-extra large. The Your Worship-fulness shirt is a medium. That was the only one left. The other shirts are size small. This merchandise is expensive so I figure I would share with my sister, who gave me some cash to buy these shirt. 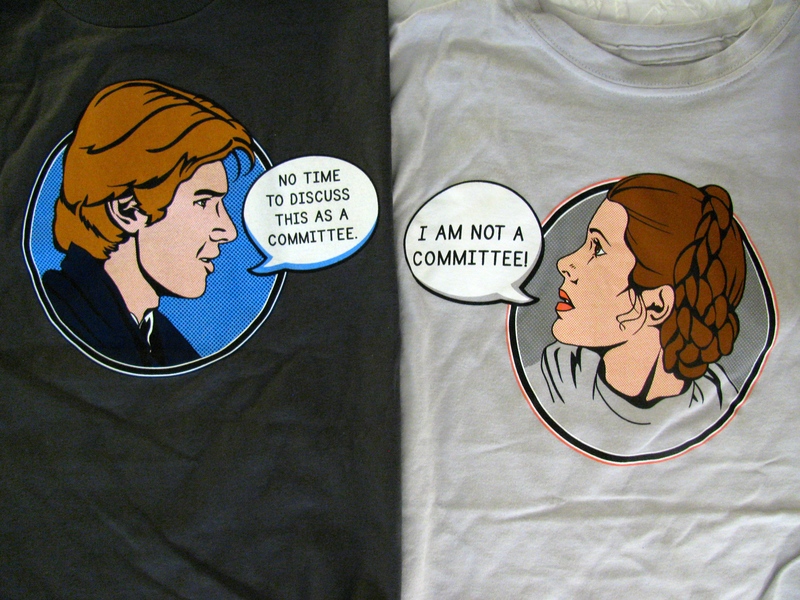 Except the Han and Leia shirts. I wanted my own. Luckily I got 2 of each in a size small.